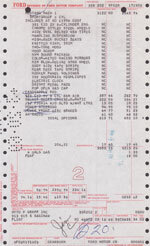 These are the original documents that were used by Ford for billing to the dealer. They contain the complete option list and, generally, the wholesale and retail costs of the base vehicle, all options, and shipping. 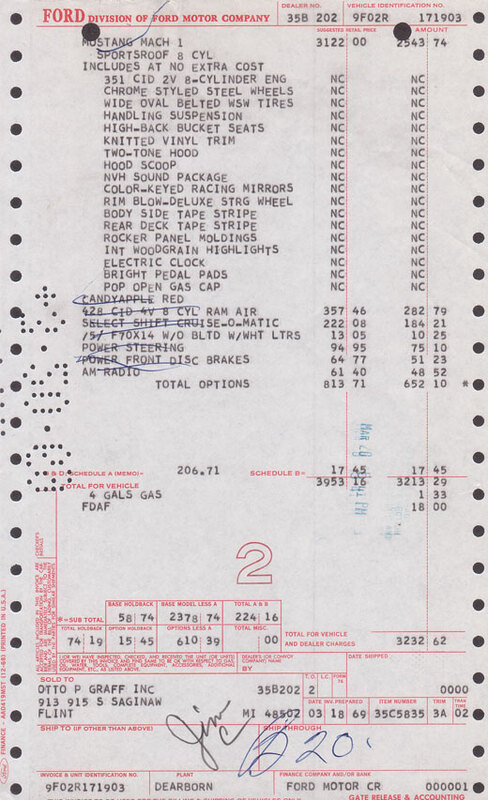 The original dealer the vehicle was shipped to is also included on the invoice along with the trim code, date the invoice was prepared, and several other items. In rare cases, the original invoice may have been sold previously. A copy would be available. We will contact you to see if you want a copy should this apply to you. Invoices will be shipped priority mail with delivery confirmation. Please note with the increasing value of these cars that many of these vehicles are now no longer just fun, vintage cars. Some of these vehicles are becoming part of Automotive History. As such, the paperwork becomes an important part of that history. If you purchase any paperwork, please use adequate care to preserve it for posterity. Requirements: You must provide copy of title or registration in the name of the buyer  no exceptions. IMPORTANT NOTE CONERNING BOSS 429 ORIGINAL INVOICES: Boss 429 Original Invoices will have multiple pages (varies 2-6 pages). The cost for these invoices are per page and are sold on an all or nothing basis. Enter your Vehicle Identification Number (VIN) as it appears on your vehicle. It is visible from the windshield, near the front of the dash. Your VIN should be 11 digits and begin with a number if your vehicle is a car and a letter if it is a truck. To ensure this original document goes to the rightful owner, you must provide proof of ownership in the name of the buyer. Please upload a picture or scan of your vehicle title or current registration. Make sure the serial number (or VIN) and owner name are clearly visible on the uploaded image. Window Sticker - We offer exact reproductions of the original window sticker. VIN Report - You can include one of our VIN Reports with your order.